Injuries and Rehab Discuss Injuries and Rehabilitation here. Knee pain is not fun. The pain stinks but worse than the pain is the inability to use your knees for things you would like to use them for- like cardio or lifting. We always hear about R.I.C.E. or now what they call the P.R.I.C.E. treatment. I am sure you can guess what the hardest part of the treatment is right? Yep..... REST. I don't want to rest. I need my knees healthy NOW. The ice is good initially after an injury but I use it ice alot after workouts and cardio injury or not. I like to use heat to draw blood into an area that is hard to get blood into. Compression? Never really used it too much, but elevation I have used in conjuction with ice when my knees (especially my right knee) are swollen or sore. WHAT I LOVE BEST about P.R.I.C.E. is the protection part! I use a very sturdy one while doing heavy pressing movements, and I use knee sleeves when I do alot of cardio like basketball or skateboarding. Alot of guys don't want to wear a brace because they think it looks bad. You have to get over that quickly. Lee Haney use to use very sturdy knee braces while training quads, even for leg extensions. 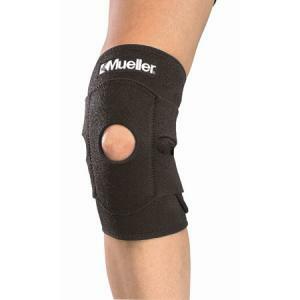 I see pros using knee braces instead of wraps these days too. Watch an NBA game and you will see that probably 6 out of 10 players have some form of knee brace. 4. Get the correct shoes. Landing in hard on the knees. Gel inserts help. 5. Don't use too much Ibuprofen. You need some inflammation. Ibuprofen can block enzymes that help repair your knees. 6. Know when to take a break from certian exercises that aggrevate your knees. If you have any other ideas please share!!! MY knees are beat from skateboarding and BMX riding in my earlier years. After 10 hour shifts at work, I had to get home and put my legs up and rest because they hurt so bad..
Ive been using Flex for 3 weeks now and what a difference!!! My Knees never hurt after work, and even after a sick Leg day I can still be pain free, moments after leaving the gym! Def. worth the $25.oo ish to try it out!
" And this time I really mean it when I say it... LIGHT WEIGHT BABY" - King Ronnie after 2011 neck surgery. Interesting! Might have to add it to my "to try" list! Good info. Cold therapy is always good for anything swollen. Def. worth it Rick, I just ordered my next can!! The pain of SELF-DISCIPLINE will never be as great as the pain of REGRET "When you want to succeed as bad as you want to breathe, then you'll be successful"
Don't let it go to long. In the type of sports where we are in internal pressure on the knee is almost always going to happen do to doing things like squats hack squats and cardio in general. Make sure you always have good shoes if you are an avid runner. I know no one really wants to hear this but an avid runner can go through a pair of shoes in about 2 months. Shoes are only good for a certain amount of time so keeping a good pair of shoes can help lessen the inflammation in the knee and ankles. there are alot of other parts of the knee that work as a whole and can be injured so the basic thing to say here is take care of them. Believe me I'm going through this right now and have to have a scope on my knee and probably the other one as well. Yeah shoes are critical too. Especially for playing sports on concrete. Lunges, front squats, and hack squats are very very hard on my knees. Good info. I would add fishoil and glucosamine supplementation. Those seem to help me.